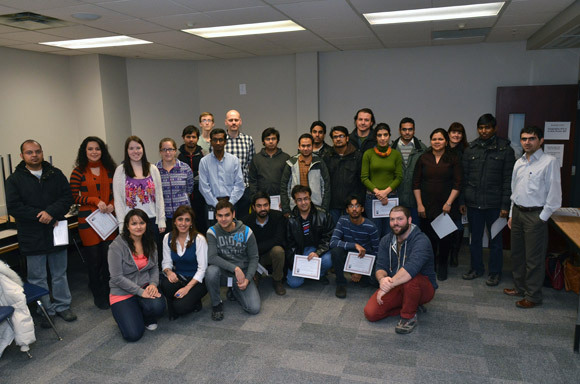 On Dec 11, 37 students from numerous faculties were presented with the Credentialing Foundations Certificate, a new accreditation for UBC Teaching Assistants that is designed to ensure the TA’s begin their teaching careers using known and tested effective strategies, as well as provide an edge in today’s increasingly competitive academic job market. A three-day seminar required participants to learn and apply instructional design in the creation of mini-lessons taught to the group. Additionally, participants were required to complete three out of four workshops in the areas of Teaching with Technology, Giving Students Feedback, Helping Students Learn, and Active Learning. To find out more about the Credentialing Foundations Certificate visit the Centre for Teaching and Learning website.